Ann duCille, professor of English, emerita, will deliver the third annual Richard Slotkin Lecture in American Studies titled “TV and the ‘Thug Default’: Why Racial Representation Still Matters.” Her talk is open to the public and begins at 4:30 p.m., Oct. 26 in the Powell Theater. “TV and the “Thug Default”: Why Racial Representation Still Matters” revisits such constructs as the “superpredator” and such cases as the “Central Park Five” in tracing the meaning, use and blackening of the term “thug.” Arguing that image is ideology—that what we see on the TV screen colors how we see black boys on the street—the talk tracks the rise of law-and-order programming that figures the black male as a dark menace to society. It demonstrates how televisual image making in compulsively stigmatizing the colored Other functions as a deadly form of racial profiling. The final section of the paper revisits the blame-a-brother racial ruses of Charles Stuart and Susan Smith as closing examples of how the racial logic of black guilt continues to influence both popular culture and public policy and also uses a riff on the Broadway musical Hamilton and the TV drama This Is Us to suggest ways of doing difference differently. Watch a partial eclipse of the Sun at Wesleyan’s Van Vleck Observatory on Aug. 21. 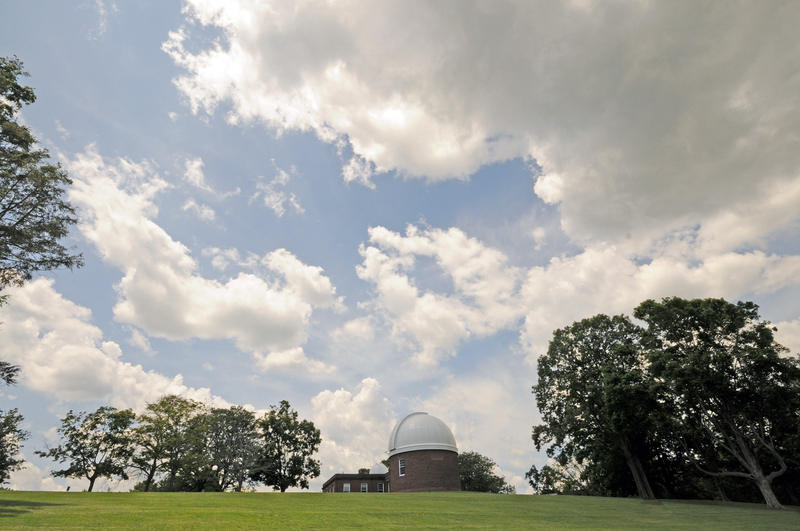 The campus and local community is invited to witness the partial eclipse of the Sun at Wesleyan’s Van Vleck Observatory on Aug. 21. While Middletown isn’t in the narrow path of totality, viewers should still be able to see about 65 percent of the Sun disappear. Telescopes for the family-friendly event will be set up at 1 p.m., and the eclipse will begin at approximately 1:20 p.m., with mid-eclipse falling at approximately 2:40 p.m. 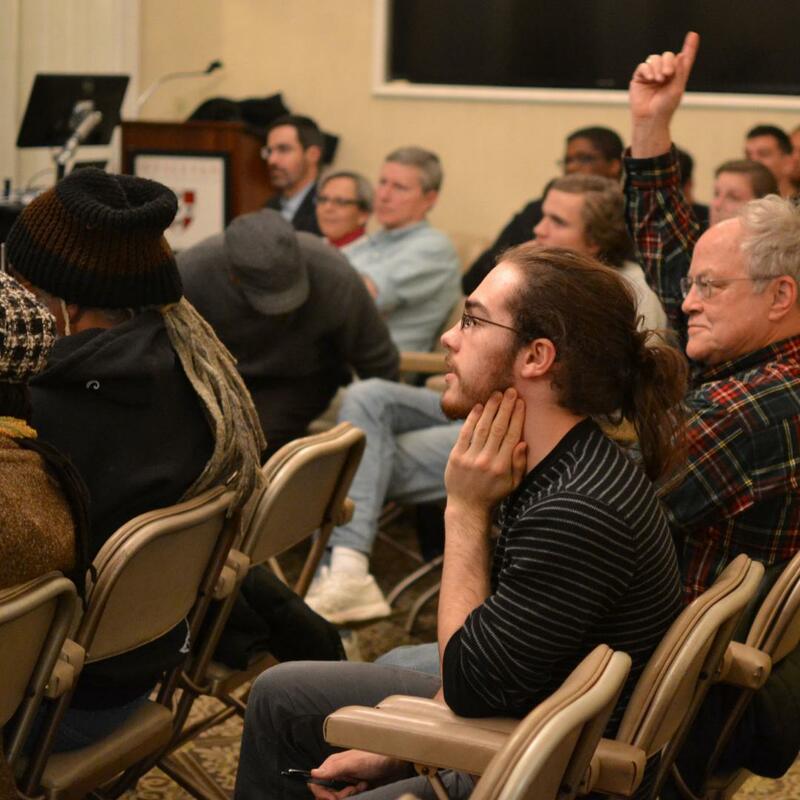 The event is hosted by Wesleyan’s Astronomy Department and is free of charge. On April 28, the Center for the Americas will host its 2017 Americas Forum on “Food Justice and Sustainability” at the Ring Family Performing Arts Hall at 2:30 p.m. The keynote address will be given by Alok Appadurai ’00. 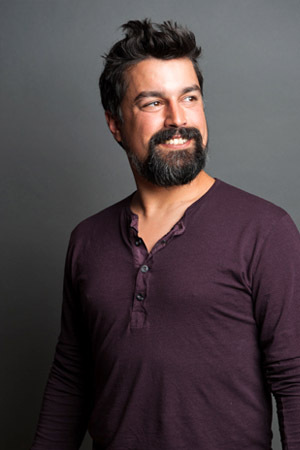 Appadurai is the the founder of Fed by Threads, a sustainable, sweatshop-free, multi-brand, American-made organic vegan clothing store that has fed over half a million meals to Americans in need. He also recently founded GoodElephant.org, a global network that aims to promote social and environmental reform by nurturing compassion and empathy. His time at Wesleyan helped to inform his current projects. As a student, he majored in American studies fashioning his own concentration that incorporated colonialism, workers’ rights, utopian communities, the environment and gender/class issues. 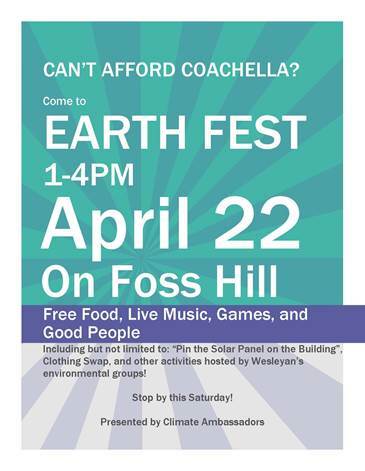 On April 22, the Wesleyan Climate Ambassadors will host the 5th Annual Earth Fest at the base of Foss Hill from 1 to 4 p.m. This celebration of Earth Day is aimed at bringing the sustainability community and campus together to honor Mother Earth. Participants will enjoy student bands, free vegan and veggie burgers, a clothing swap and a pin-the-solar-panel-on-the-building game. 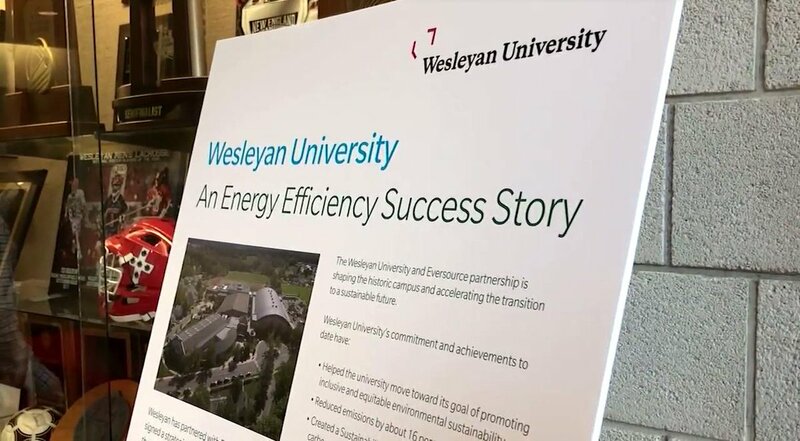 Participants also will learn more about what the sustainability community is working on at Wesleyan. The 16th Annual Wesleyan Jazz Orchestra Weekend is on April 28-29. 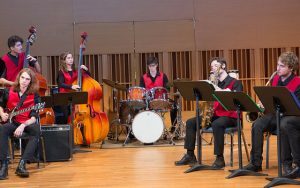 At the end of April, Wesleyan University’s concert halls will be filled with the sound of rhythm during the 16th Annual Wesleyan Jazz Orchestra Weekend, on Friday, April 28 and Saturday, April 29. The weekend will kick off with the traditional performance by the Wesleyan University Jazz Orchestra and Jazz Ensembles on Friday evening. New this year, on Saturday, there will be percussion clinics hosted by the Connecticut Percussive Arts Society, followed by an evening concert by Eli Fountain’s Percussion Discussion. 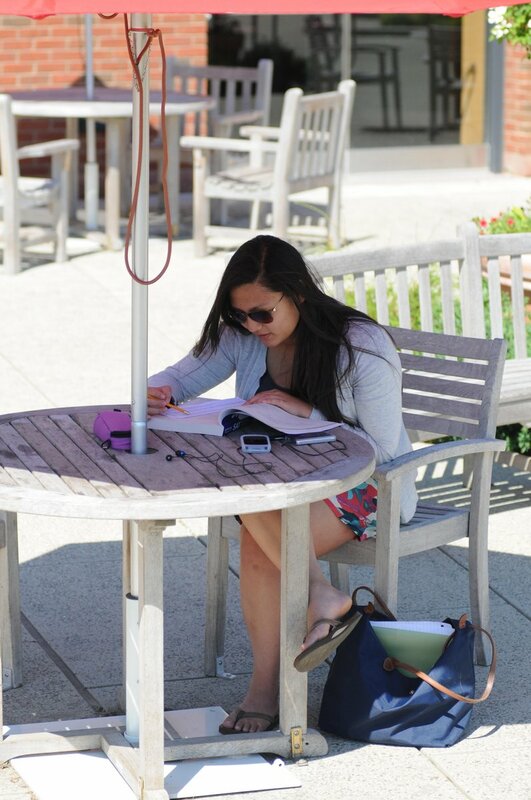 Throughout the month of April, Wesleyan is celebrating Earth Month with an array of activities. Events include film screenings, lectures, concerts, a festival on Foss Hill and more. 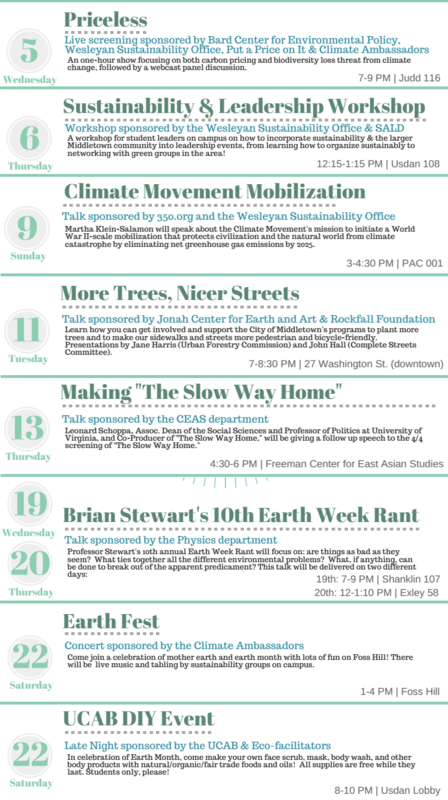 For a full list of on-and-off campus events, visit the editable Earth Month 2017 calendar. 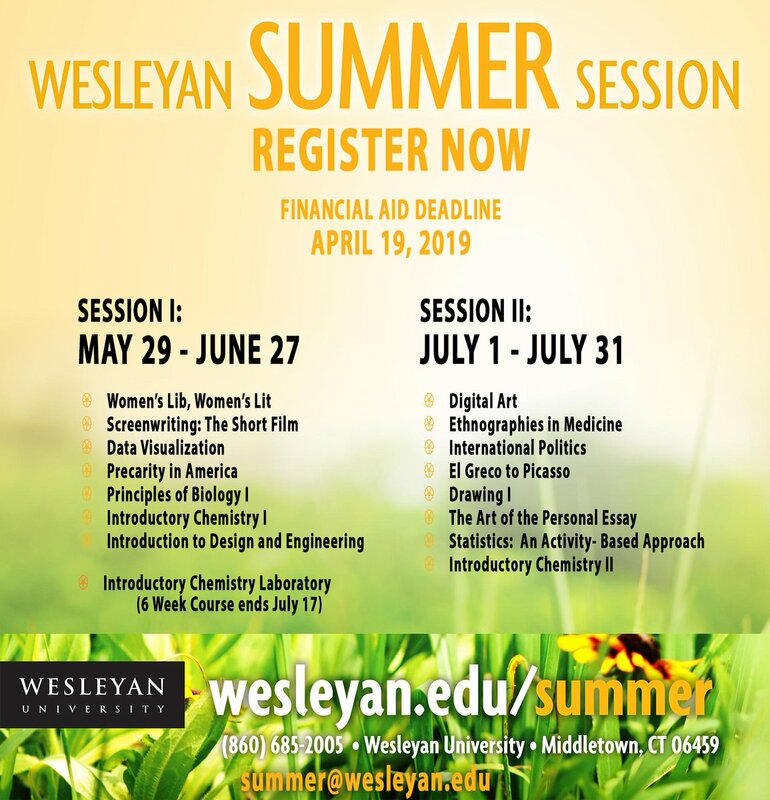 For more information email sustianability@wesleyan.edu. Fred Ayers ’17 helps a patron gather a ration of food at Amazing Grace. 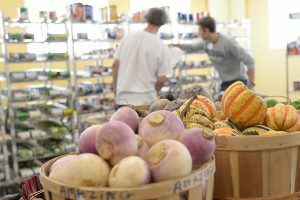 The pantry serves an estimated 3,000 individuals, or 1, 075 households each month. Ayres also leads the Hunger and Homelessness group at Wesleyan. 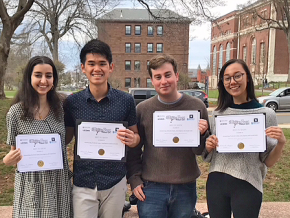 On April 12, the Hunger and Homelessness student group in the Office of Community Service will once again host the Wesleyan Hunger Banquet, an interactive simulation of global poverty rates. Attendees are placed into an income bracket at random and then provided a seating arrangement and meal indicative of that income level. 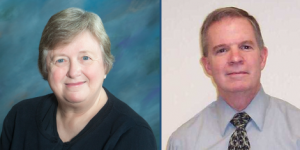 The event will take place in Woodhead Lounge from 5-7 p.m. Anthony Hatch, assistant professor of sociology, assistant professor of science in society, assistant professor of African American studies, will serve as MC, and Ron Krom of St. Vincent de Paul will speak at the event. 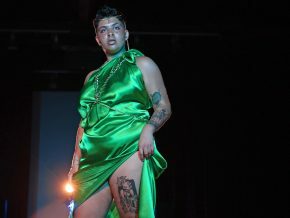 Tickets will be sold in Usdan University Center April 7-12, and can also be purchased at the door. No RSVP is required. Proceeds will be donated to Amazing Grace Food Pantry, and the group aims to raise over $500. 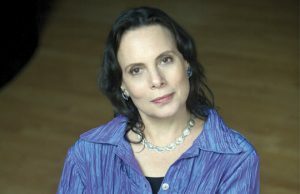 Director and playwright Emily Mann will give a talk at Wesleyan on March 28. Director and playwright Emily Mann will give a talk at Wesleyan on March 28 as part of the Performing Arts Series of the Center for the Arts. Mann will be in conversation with Wesleyan’s Shapiro Distinguished Professor of Writing and Theater Quiara Alegría Hudes. A Conversation with Emily Mann will take place in Memorial Chapel at 7 p.m., Tuesday, March 28 and is free and open to the public. 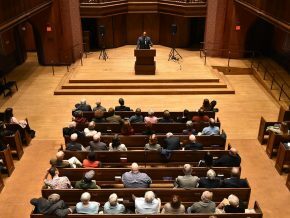 With the proposed elimination of the National Endowment for the Humanities (NEH), the National Endowment for the Arts (NEA), and the Institute of Museum and Library Services (IMLS), one representative of the arts community at Wesleyan has petitioned against these cuts alongside the Northeast Small College Art Museum Association (NESCAMA). 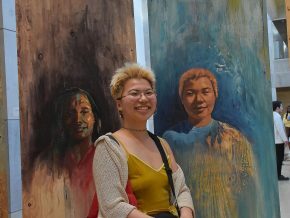 Clare Rogan, curator of the Davison Art Center at Wesleyan University, joined the initiative on behalf of Wesleyan. In 2014, the Davison Art Center was the recipient of a three-year IMLS grant in the amount of $111,000 to further the digital imaging of works on paper in the art center’s permanent collection. The statement, signed by 18 institutions affiliated with NESCAMA, explains how college art museums rely on funding from these sources.